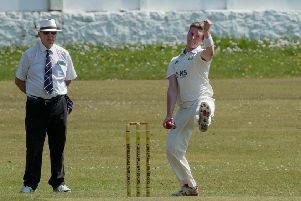 Clitheroe captain Paul Gaskell believes the champions have continued from where they left off last term. The club lost just twice in 24 outings on their way to securing the Ribblesdale Cricket League title. And now, having won their three opening games against Baxenden, Euxton and Whalley, the Chatburn Road outfit’s unbeaten run has now stretched beyond nine months. The last time the club tasted defeated in a league fixture came at the end of August when Settle won by four wickets thanks to Imran Khalid’s unbeaten knock of 75 in a strong partnership with Robbie Davidson (49). “Winning is a good habit to have,” said Gaskell. “We’ve started well and that’s what we’re all about. The latest triumph arrived in the form of a 62-run win against Whalley at Station Road. Jack Dewhurst (33), Neil Bolton (43) and professional Janaka Guneratne (35) were the main contributors to the away side’s total of 138-6 from a rain-reduced 33 over spell, though they were all among Simon Gorton’s six-wicket haul. But another fruitful spell of bowling from Clitheroe’s Sri-Lankan all-rounder helped the visitors over the line. Guneratne took 5-16 from 7.3 overs as the defending champions took maximum points. “To get 12 points in a shortened game is obviously a bonus,” said Gaskell. Guneratne has accumulated 133 runs and 16 wickets in three league matches so far. And Gaskell was full of praise for the club’s paid man: “We know what we get with him. It’s good to have him about the club and the lads love him. Clitheroe travel to take on Brooksbottom on Saturday.